By doing something really difficult you have a sense of achievement. Something to be proud of for the rest of your life. By taking on Mother Nature’s toughest challenges, you will accomplish something very special and create memories to cherish. The Clipper Race is unlike anything else on the planet. Ken Read, the PUMA Ocean Racing skipper, has two Volvo Ocean Races under his belt - so when it comes to the Southern Ocean, he knows what he's talking about. Video published August 16, 2016. Navigator and marine biologist Will Oxley has sailed over 250,000 miles in his career, and spent plenty of time in the Southern Ocean. Here, he chats about just how tough it is, and the 2017-18 route. Video published August 16, 2016. August 26: MIAMI – The Coast Guard established port readiness condition x-ray for the port of Key West effective at 10 a.m. Friday due to the expectation of sustained winds of 25 mph with wind gusts up to 40 mph. The port of Key West is currently open to all commercial traffic, and all transfer operations may continue while x-ray remains in effect. Mariners are reminded there are no safe havens in the port of Key West, and the port is safest when the inventory of vessels is at a minimum. All oceangoing commercial vessels and oceangoing barges greater than 500 gross tons should make plans if conditions deterioriate and port condition yankee is set. Recreational boaters are advised to seek safe harbor. The Snake Creek drawbridge will be locked down when sustained winds reach 39 mph or when an evacuation is in progress. Port facilities are advised to review their heavy-weather plan and to take all necessary precautions to adequately prepare for the expected conditions. If and when port readiness condition yankee is set, meaning hurricane force winds are expected within 24 hours, vessel movement shall be restricted, and all movements must be approved by the Captain of the Port. If and when port readiness condition zulu is set, meaning hurricane force winds are predicted within 12 hours, no vessels may enter or transit within the safety zone without the permission of the COTP. All vessel movements will be prohibited, and all ship-to-shore operations must be ceased. Stay off the water. The Coast Guard’s search and rescue capabilities degrade as storm conditions strengthen. This means help could be delayed. Boaters should heed to weather watches, warnings and small craft advisories. Evacuate as necessary. If mandatory evacuations are set for an area, the public should evacuate without delay. Coast Guard personnel and other emergency responders may not be able to evacuate those in danger during the storm. Secure belongings. Owners of large boats are urged to move their vessels to inland marinas so they will be less vulnerable to breaking free of their moorings or sustaining damage. Trailerable boats should be pulled from the water and stored in a place is not prone to flooding. Those who are leaving their boats in the water are reminded to remove EPIRBs and to and secure life rings, lifejackets and small boats. These items, if not properly secured, can break free and require valuable search and rescue resources be diverted to ensure people are not in distress. Stay clear of beaches. Wave heights and currents typically increase before a storm makes landfall. Even the best swimmers can fall victim to the strong waves and rip currents. Swimmers should stay clear of beaches until local lifeguards and law enforcement officials say the water is safe. Be prepared. Area residents should prepare now and develop a family plan, create a disaster supply kit, determine a place to go if necessary, secure their home and create a plan for pets. Information can be found at the National Hurricane Center's webpage. Stay informed. The public should monitor the progress and strength of Invest 99L through local television, radio and internet. Boaters can monitor its progress on VHF radio channel 16, including small craft advisories and warnings. For information on the progress of Invest 99L and hurricane preparedness, please visit the National Hurricane Center's web page at http://www.nhc.noaa.gov/. (Coast Guard press release). US Coast Guard press release: MIAMI – The Coast Guard repatriated 161 Cuban migrants to Bahia de Cabañas, Cuba, since Monday. The Coast Guard Cutter Isaac Mayo repatriated 66 Cuban migrants, Monday, the Coast Guard Cutter Raymond Evans repatriated 68 Cuban migrants Thursday, and another 27 Cuban migrants Friday. These repatriations are a result of 14 separate at-sea interdictions in the South Florida Straits. Each instance is an example of the Coast Guard helping secure the U.S. border and preventing these at-sea voyages from ending in tragedy. “We discourage anyone from taking to the sea and attempting to reach U.S. soil illegally – they are risking their lives with very little chance of success,” said Capt. Mark Gordon, chief of enforcement for the Coast Guard 7th District. 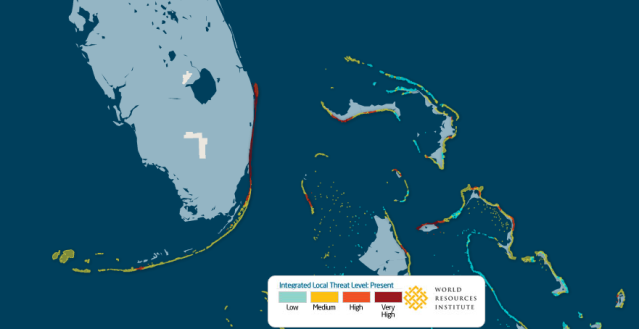 “Navigating the Florida Straits can be extremely dangerous for the unprepared on illegal voyages and often leads to injury or death.” Once migrants are aboard a Coast Guard cutter, all migrants receive food, water, shelter and medical attention. Since October 1, at least 6,318 Cubans have attempted to migrate to the U.S. via maritime means compared to 4,473 in the fiscal year 2015. These statistics represent the total number of at-sea interdictions, landings and disruptions in the Florida Straits, Caribbean and Atlantic. UPDATE August 25, 2016: "The Coast Guard set port condition whiskey (pdf) for Port Miami, Miami River, Port Everglades, Port of Palm Beach, Port of Ft. Pierce and all other South Florida terminals and facilities at 4 p.m. Thursday due to the expectation sustained gale force winds generated by Invest 99L may arrive within 72 hours. These ports and facilities are currently open to all commercial traffic and all transfer operations may continue while whiskey remains in effect. Sustained winds between 39 and 54 mph are possible within 72 hours. Mariners are reminded there are no safe havens in these facilities and ports are safest when the inventory of vessels is at a minimum. All ocean-going commercial vessels and ocean-going barges greater than 500 gross tons should make plans for departing the port. Vessels desiring to remain in port must immediately contact the Captain of the Port, Coast Guard Sector Miami at (305) 535-4472, to receive permission to do so and are required to submit a safe mooring plan in writing. Vessels bound for South Florida unable to depart 24 hours prior to threatening winds making landfall are advised to seek an alternate destination." Read more here. See also: Coast Guard urges boaters to prepare for impending severe weather. U.S. Coast Guard press release - August 24, 2016 7:32:46 AM PDT: The U.S. Coast Guard advises mariners, recreational boaters, swimmers, surfers and the general public in Puerto Rico and the U.S. Virgin Islands Wednesday to remain vigilant, exercise good judgment and make any preparations in anticipation to an incoming tropical wave. "We advise citizens and boaters to make preparations and monitor official weather updates as this tropical wave moves through the area," said Capt. Robert Warren, Sector San Juan commander and Captain of the Port San Juan. "Swimmers, recreational boaters and the general public should exercise caution and stay away from shoreline rocks until weather and surf conditions normalize. We will continue to monitor the winds and sea conditions in our area of responsibility." "Mariners should avoid unnecessary risk and use extreme caution if heading out on the water," said Capt. Megan Dean, Sector Miami Commander. "Remember to remove your EPIRB from your vessel if the vessel will not be in use. EPRIBs left aboard vessels, with no one aboard, often get activated and result in a false alert. False alerts can cause a delay in Coast Guard search and rescue operations." Contact local marinas to ask for advice about securing your vessel. Marina operators are knowledgeable and can advise you on the best methods for securing your boat. Take action now. The effects of a storm can be felt well in advance, and bridge schedules can and often shift from their normal operating schedule. Check with local authorities before entering any storm-damaged area. When removing your EPIRB from your vessel, ensure it does not inadvertently activate which could signal a false alert. Furthermore, once the severe weather has passed, mariners are reminded to ensure the EPIRB devices are placed back on their vessels prior to the vessel's next use. Do not rush to your boat. Boaters should not place themselves in danger to get to a boat. Do not try to board a partially sunken boat. Seek salvage assistance from a professional. Storms move quickly and are unpredictable. The peak of the hurricane season – why now? | National Oceanic and Atmospheric Administration: From mid-August through mid-October, the activity spikes, accounting for 78 percent of the tropical storm days, 87 percent of the category 1 and 2 hurricane days (Saffir-Simpson Hurricane Wind Scale), and a whopping 96 percent of the major (category 3, 4 and 5) hurricane days. Day 1 of Audi Hamilton Race Week 2016 provided the first opportunity for Wild Oats XI and Scallywag to go head-to-head on an inshore race course. The two boats shadowed each other in the pre-race manoeuvres prior to the start of a race to Lindeman Island and back, starting in Dent Passage. Both boats made a fine spectacle as they reached to the northern tip of Dent Island before heading upwind to Lindeman Island. Dale Lorimer of Bow Caddy was on the water and recorded this brief cameo of the start line encounter between the two super maxis. 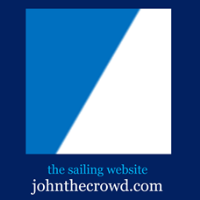 The International Women's Keelboat Championship is Back! Original Commentary - The dramatic moments on the 5th of March 1995, when during round four in the round robin stage of the Americas Cup challenger series, and in a match race between One Australia and Team New Zealand, the Australian boat split and sunk within two minutes. Team Nika started with a 12-point advantage in the 11 boat fleet, so had all but won the regatta before this. As tactician Ed Baird explained: "The only way we couldn't win was if Team Aqua won and we had a collision and got penalty points." Team Aqua took second place regaining the RC44 golden wheels as current Championship Tour leaders and Katusha took third. The RC44 Portsmouth Cup is the third event of the 2016 Championship Tour, which pitts the world's top businessmen and the best sailors in the industry compete in high performance one-design 44-foot carbon racing yachts. RC44 VALLETTA CUP - 23 - 27 November - The last event of the 2016 tour will be in Malta’s renowned capital Valletta, City of the Knights. 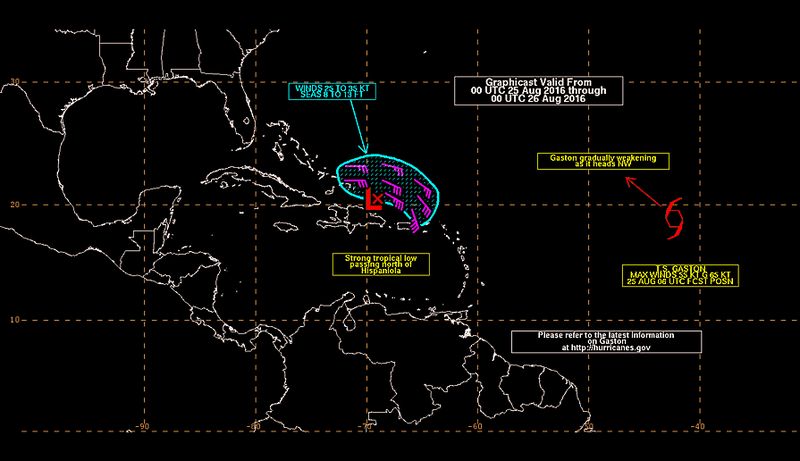 NOAA Has Upped the Atlantic Hurricane Forecast, Are You Prepared? Atlantic hurricane season still expected to be strongest since 2012 | National Oceanic and Atmospheric Administration: "August 11, 2016 In its updated 2016 Atlantic Hurricane Season Outlook, NOAA calls for a higher likelihood of a near-normal or above-normal season, and decreases the chance of a below-normal season to only 15 percent, from the initial outlook issued in May. 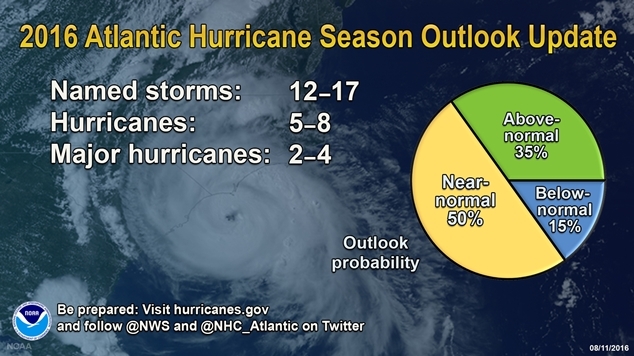 The season is still expected to be the most active since 2012 ..."
NOAA's updated 2016 Atlantic Hurricane Season Outlook indicates an 85% chance that season will either be near-normal or above-normal. The outlook calls for a 50% chance of a near-season, a 35% chance of an above-normal season, and only a 15% chance of a below-normal season. See NOAA definitions of above-, near-, and below-normal seasons. The Atlantic hurricane region includes the North Atlantic Ocean, Caribbean Sea, and Gulf of Mexico. Compared to the pre-season outlook issued 27 May, the probability of either a near-normal or above-normal season has increased to 85% (compared to 75% in May), and the probability of a below-normal season has decreased to 15% (from 25% in May). The season is still expected to be the strongest since 2012. Accumulated Cyclone Energy (ACE) range of 85%-150% of the median. Each of these ranges is higher than was predicted in the May outlook (which indicated likely ranges of 10-16 named storms, 4-8 hurricanes, and 1-4 major hurricanes). The seasonal activity is expected to fall within the predicted ranges in 70% of seasons with similar climate conditions and uncertainties to those expected this year. These ranges do not represent the total possible ranges of activity seen in past similar years. During 1981-2010, Atlantic hurricane seasons averaged 12 named storms, 6 hurricanes, 3 major hurricanes, and 92.4% of the median ACE. 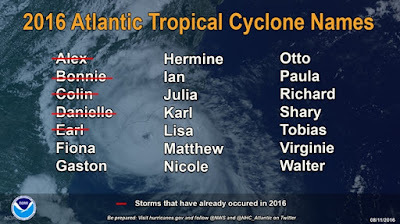 To date, the 2016 Atlantic hurricane season has produced five named storms, with two being hurricanes. Therefore, for the remainder of the season, we expect (with 70% probability for each range) an additional 7-12 named storms, of which 3-6 are expected to become hurricanes and 2-4 of those are expected to become major hurricanes. The strength of the hurricane season is largely controlled by conditions and activity within the Main Development Region (MDR, which spans the Caribbean Sea and tropical Atlantic Ocean between 9°N-21.5°N; Goldenberg et al. 2001). This year, although competing factors are still likely within the MDR during the peak months (August-October) of the hurricane season, overall conditions within the MDR are now expected to favor a more active season than was predicted in May. However, there remains considerable uncertainty regarding when La Niña will develop and how strong it will become, which leads to uncertainty as to whether the Atlantic hurricane season will be near-normal or above normal. The main factors that are conducive to a more active season now compared to the May outlook include 1) the disappearance of El Niño's suppressing influence on Atlantic hurricanes, 2) weaker vertical wind shear across the central MDR, 3) somewhat weaker trade winds across portions of the southern MDR, and 4) a stronger west African monsoon. The main competing factors this season are 1) anomalous sinking motion and increased vertical wind shear in the western MDR (which are somewhat related to the active eastern Pacific hurricane season), and 2) less conducive global sea surface temperature (SST) patterns. A stronger La Niña could weaken or dissipate some of these competing factors and result in an above-normal season, while a weak or non-existent La Niña may allow these conditions to persist and thereby favor a near-normal season. Model predictions are now generally calling for only a border-line weak La Niña to form during August-October. 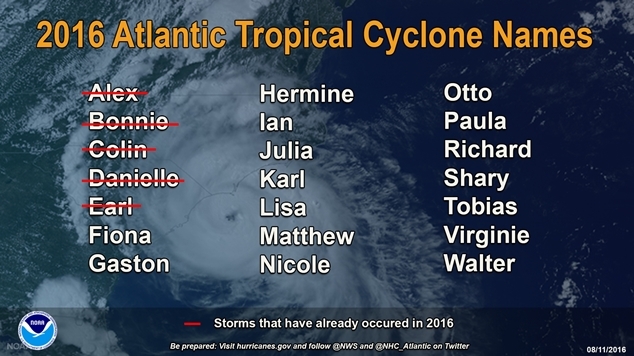 Five named storms (Alex, Bonnie, Colin, Danielle, and Earl) have formed in the Atlantic basin to date. Alex, which formed last January, and Earl became hurricanes. Four storms to date have made landfall, including Bonnie in South Carolina, Connie in western Florida, Danielle in eastern Mexico, and Earl in Belize and Mexico. It only takes one storm hitting an area to cause a disaster, regardless of the overall activity. 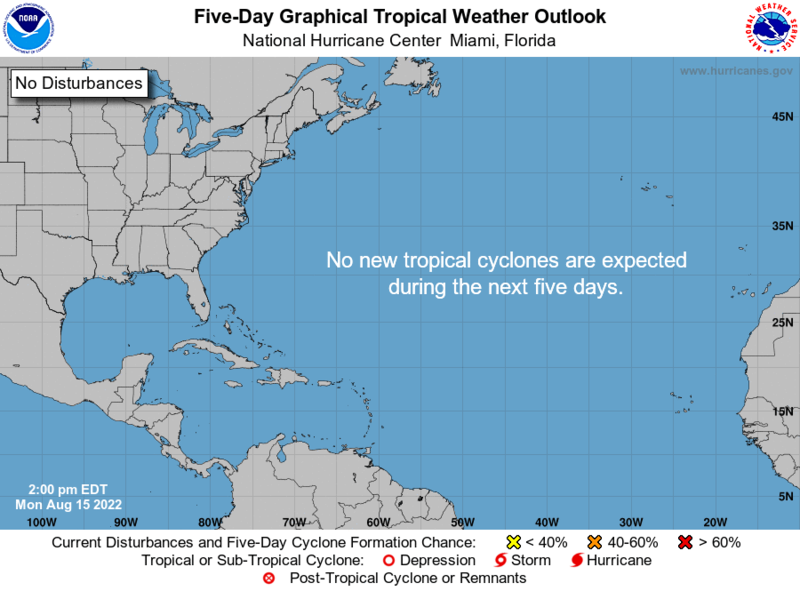 Therefore, residents, businesses, and government agencies of coastal and near-coastal regions are urged to prepare every hurricane season regardless of this, or any other, seasonal outlook. Predicting where and when hurricanes will strike is related to daily weather patterns, which are not reliably predictable weeks or months in advance. Therefore, it is currently not possible to accurately predict the number or intensity of landfalling hurricanes at these extended ranges, or whether a particular locality will be impacted by a hurricane this season. After 14 days, 6 hours and 55 minutes of running, 100% Natural Energy arrived in Vendée in 12th spot. Oldest boat in the fleet and after a delayed start of 24, Conrad arrives at a new generation of boat (2015 vs 2005!). The sequence of 2 Transatlantic allowed Conrad to take stock of the ship's equipment and imagine what could be improved for the Vendée Globe. The Vendée Globe starts on November 6 in Les Sables d'Olonne. Chief Scientist of the Catlin Seaview Survey Professor Ove Hoegh-Guldberg underwater on the Great Barrier Reef. In this Seaview Science video Ove talks about the importance of coral reefs. Published July 1, 2013. 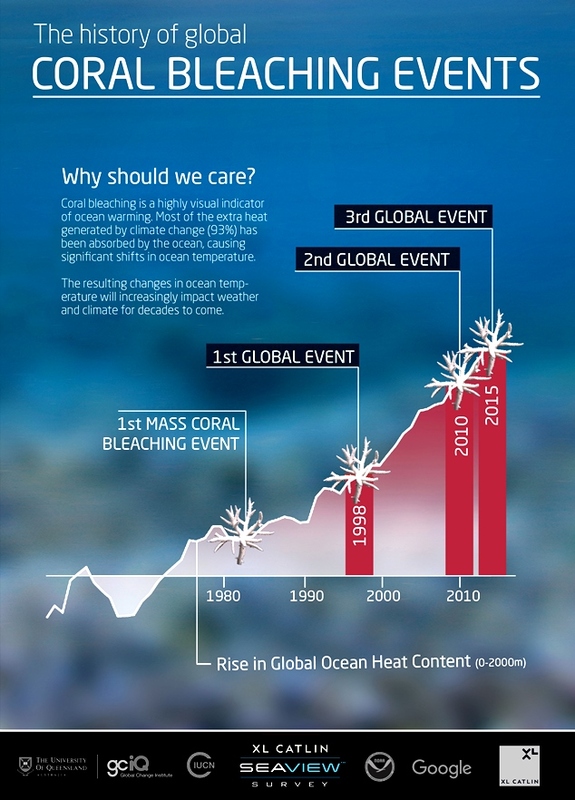 GlobalCoralBleaching.org: "In 1998, a huge underwater heatwave killed 16% of the corals on reefs around the world. Triggered by the El Niño of that year, it was declared the first major global coral bleaching event. The second global bleaching event that struck was triggered by the El Niño of 2010. The US National Oceanic & Atmospheric Administration (NOAA) announced the third global bleaching event in October 2015 and it has already become the longest event recorded, impacting some reefs in consecutive years. The new phenomenon of global coral bleaching events is caused by ocean warming (93% of climate change heat is absorbed by the ocean). Corals are unable to cope with today’s prolonged peaks in temperatures – they simply haven’t been able to adapt to the higher base temperatures of the ocean. Although reefs represent less than 0.1 percent of the world’s ocean floor, they help support approximately 25 percent of all marine species. As a result, the livelihoods of 500 million people and income worth over $30 billion are at stake ..."
Saturday saw the final full-fleet races in the Laser and Laser Radial classes, and dramatic finishes for Team USA sailors competing in both fleets. Massive Lake Okeechobee algae bloom getting more toxic | TCPalm.com: "Algae blooms in the St. Lucie River [which drains into the Atlanctic Ocean] are getting more numerous, and a massive bloom in Lake Okeechobee apparently is getting more toxic. Blue-green algae samples taken June 14 and 15 from Lake O contained more than 20 times the amount of toxins considered hazardous by the World Health Organization..."
Fort Lauderdale: Beach monitor spots 11 sea turtles and one brick of cocaine - "... Doug Phinney walked into a bar on A1A about 1 a.m. Tuesday with an open kilo of suspected cocaine in his hands, he wasn't looking to make a sale or even worried about being arrested. In fact, he was looking for a cop. 'I finally flagged down an officer driving by,' said Phinney, 52, from Wilton Manors. 'And I showed him what I found.' Phinney made his discovery on the sands of Fort Lauderdale beach during a routine nighttime patrol as a volunteer with the Sea Turtle Oversight Program, designed to protect the behemoth sea creatures during the summer nesting season. During his four-hour patrol he did spot 11 loggerhead turtles who swam ashore to lay eggs." Read more at Sun-Sentinel. Video above published August 11, 2016 - Less than 30 days until the best sailors and fastest boats touch down in Toulon, France Sept 9-11, 2016. Louis Vuitton America's Cup World Series Toulon will mark the first time America's Cup racing has been held in French waters for over 10 years. Groupama Team France skipper Franck Cammas spoke to us about why this event is important to him and his team. Toulon, France, September 10-11, 2016. Maxi Yacht Rolex Cup 2016 - Preview - Rolex World of Yachting - The Maxi Yacht Rolex Cup was born to provide the largest, most powerful yachts with an opportunity to compete directly in a suitably challenging environment. Continuing that philosophy, it is also widely regarded as a showcase for the latest advances in design and technology. The Costa Smeralda has provided the stunning setting and testing conditions ever since the first Maxi World Championship was held there in 1980. The brainchild of the Yacht Club Costa Smeralda and its president, the Aga Khan, the Maxi Yacht Rolex Cup is an eagerly anticipated annual event attracting a sizeable fleet of yachts all over 60 feet (18.29 metres) in length. 2016 marks the 27th edition of the competition and includes the vaunted Rolex Maxi 72 World Championship. The Costa Smeralda provides a stunning setting and a variety of great, challenging conditions for the Maxi Yacht Rolex Cup, one of the highlights of the Mediterranean yachting season. The first ever Maxi World Championship held in Sardinia in 1980 was the brainchild of the Yacht Club Costa Smeralda and it's President, the Aga Khan. the regatta is now an eagerly anticipated annual event and attracts a sizeable fleet of majestic maxi yachts to Porto Cervo each September. 2016 marks the 27th edition of the competition which comprises the seventh running of the much-vaunted Rolex Maxi 72 World Championship. Video above published on Aug 11, 2016. More info here. Every two years, since 1980, the Swan fleet has gathered at its spiritual home at the Yacht Club Costa Smeralda in Sardinia for the biennial Rolex Swan Cup. Owners, crews and guests meet for a week of spirited activity on and off the water. 2016 will be a celebratory event, marking the fiftieth anniversary of the founding of Nautor’s Swan. 121 yachts have entered this, the 19th, edition, ranging in size from 36 (10.9 metres) to 115 feet (35m), and in age from 49 years to a few months. As always, this year’s Rolex Swan Cup will be characterized by great competition in an enviable environment, a prevailing spirit of fair play and yachts renowned for their grace, enduring appeal and rich heritage. More info at http://www.yccs.it/en/ and here. Friendly Floatees are plastic bath toys marketed by The First Years, Inc. and made famous by the work of Curtis Ebbesmeyer, an oceanographer who models ocean currents on the basis of flotsam movements including those of a consignment of Friendly Floatees, containing 29,000 plastic yellow ducks, red beavers, blue turtles and green frogs, washed into the Pacific Ocean in 1992. Some of the toys landed along Pacific Ocean shores, like Hawaii. Others traveled over 17,000 miles, floating over the site where the Titanic sank, and spent years frozen in Arctic ice to reach the Eastern Seaboard, British and Irish shores 15 years later in 2007 - Wikipedia. Great Pacific garbage patch | Wikipedia: "The Great Pacific garbage patch was described in a 1988 paper published by the National Oceanic and Atmospheric Administration (NOAA) of the United States. The description was based on results obtained by several Alaska-based researchers between 1985 and 1988 that measured neustonic plastic in the North Pacific Ocean. Researchers found high concentrations of marine debris accumulating in regions governed by ocean currents. Extrapolating from findings in the Sea of Japan, the researchers hypothesized that similar conditions would occur in other parts of the Pacific where prevailing currents were favorable to the creation of relatively stable waters. They specifically indicated the North Pacific Gyre. 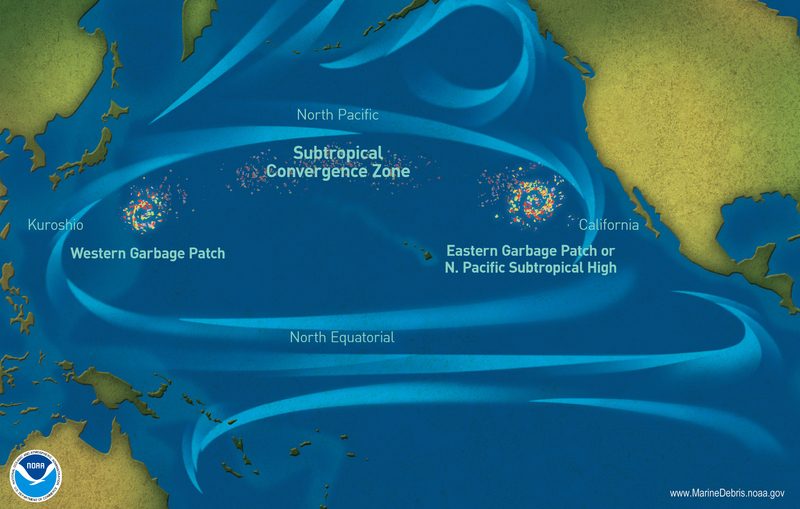 Charles J. Moore, returning home through the North Pacific Gyre after competing in the Transpac sailing race in 1999, claimed to have come upon an enormous stretch of floating debris. Moore alerted the oceanographer Curtis Ebbesmeyer, who subsequently dubbed the region the "Eastern Garbage Patch" (EGP). The area is frequently featured in media reports as an exceptional example of marine pollution." Enjoy the most beautiful shots from the Puerto Portals​ Sailing Week. Next stop: Mahón for the TP52 World Championships. Video above published on Aug 4, 2016. France victorious in the 2016 Brewin Dolphin Commodores’ Cup. Video shown at the prize giving includes interviews with winners and race officials, plus footage from the final race on day 7. The club’s biennial flagship event for three boat teams with Corinthian crews is a supreme test, held on the navigationally complex waters of the Solent and the Channel, and featuring a range of race courses – windward-leewards, round the cans, an overnight offshore race and a race around the Isle of Wight, that on this occasion took place in sun and a 20-25 knot southwesterly. It is also something of a rarity in modern grand prix yachting – an event that lasts a whole week. And to win requires a team effort: All three boats in each team must pull their weight. Worthy winner on this occasion was France Blue comprising Eric de Turkheim’s A13, Teasing Machine, the Prietz family’s Ker 39, GOA and yacht designer Daniel Andrieu on his Sun Fast 3200, Cifraline 4. This marked the 10th anniversary of when Commodores’ Cup legend Géry Trenteseaux last led a French team to victory. Newport delivered on its promise as one of the best sailing venues in the world making the 2016 Race Week at Newport presented by ROLEX one of the best Race Week's ever hosted. Published July 16, 2016 by New York Yacht Club.